Dr. Sharon Swartz is a Professor in the Department of Ecology and Evolutionary Biology and the School of Engineering at Brown University. She received her Masters and PhD in Evolutionary Biology from the University of Chicago. Afterward, she served as a faculty member at Northwestern University for a few years before joining the faculty at Brown University. Sharon has received many awards and honors during her career, including the Distinguished Alumni Service Award from the University of Chicago, the Karen T. Romer Prize for Excellence in Advising, the Dean’s Excellence in Teaching Award from Brown Medical School, the American Medical Women’s Association Gender Equity Award, and the Mary Putnam-Jacobi Award for the Outstanding Woman Medical Faculty Member from Brown University Women in Medicine. Sharon is with us today to tell us all about her journey through life and science. Early in her career, Sharon turned her attention from primate locomotion to bat flight, and has also maintained interests in aspects of size and scale in animal architecture. 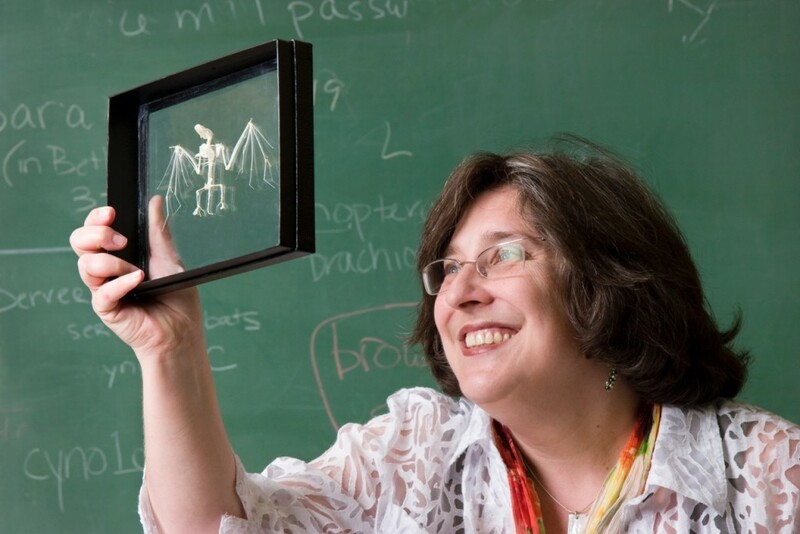 Her work on bats includes studies of dynamics of wings in bat flight, bat aerodynamics and energetics, mechanical properties of tissues of the bat wing, and function and evolution of muscles of the wing. Her active collaborations link biology to engineering, computer science, and mathematics, and her interdisciplinary research group has been supported by the National Science Foundation, the Air Force Office of Scientific Research, and private foundations. She teaches courses on topics at the biological/physical science interface to students from a broad range of backgrounds, and encourages exploration of scientific subjects through diverse media, including visual arts, music, poetry, and modeling. She has served as the Chair of the Division of Comparative Biomechanics of the Society for Integrative and Comparative Biology, and her honors include the University of Chicago Distinguished Service Award and Brown University’s Romer Prize, the institution’s highest award for mentoring undergraduate students.